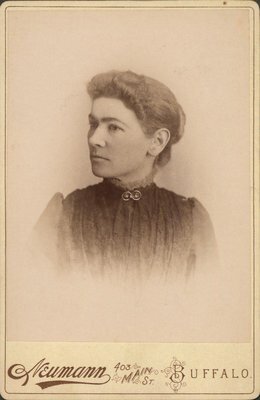 A photograph of Alice Jane Ross. J. Neumann was a photographer in Buffalo, New York, USA, who operated the Arcade Photographic Studio, located at 403 Main Street. Reverse side: The Arcade Photographic Studio, J. Neumann, No. 403 Main & No. 1 Clinton Sts., Buffalo, N.Y.